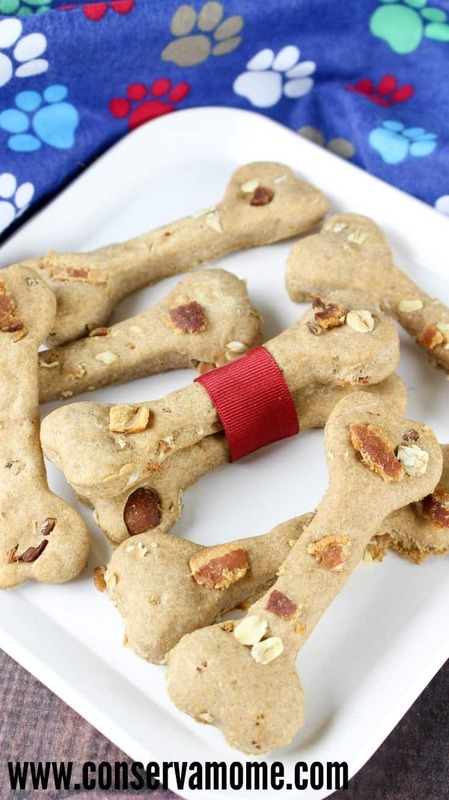 This delicious Peanut Butter, Bacon and Oatmeal Dog Biscuit Recipe is the perfect homemade gift for your furry friend. Excellent for Gift giving or just because! Are you a dog owner? There is nothing like a canine to make a house a home. 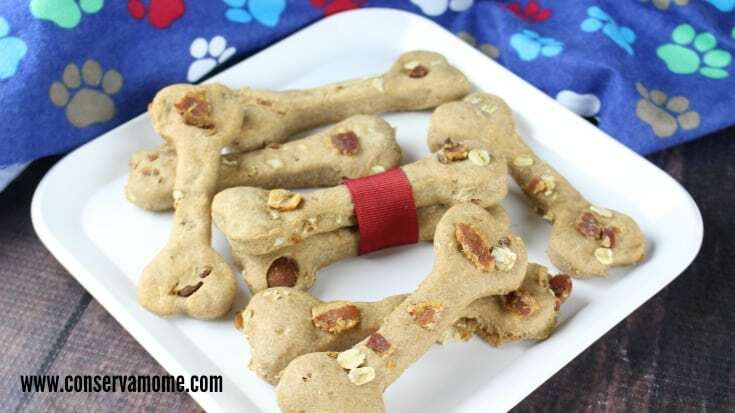 You make yummy goodies for the humans you love, so why not make a batch of these peanut butter, bacon and oatmeal dog biscuits for the four legged loves in your life. Dogs everywhere agree, nothing says ‘I love you’ like peanut butter or bacon. 2. In a large bowl, add the peanut butter, milk and egg. Stir well until mixed. 3. Add the flour and baking powder. Mix well to incorporate all of the ingredients. 4. Knead the dough 8-10 times until it is firm and elastic. You can knead directly in the bowl or if you prefer, on a level workspace. 5. Sprinkle 1 Tablespoon of flour onto your workspace and place the kneaded ball of dough on top. Flatten the dough a bit and sprinkle the crumbled bacon and oats on top. Knead the dough 4-5 more times to distribute the bacon and oats. 6. Using a rolling pin, roll the dough out to 1/4″ thickness. Cut out 12 dog bone shapes with your cookie cutter and place on the lined baking sheet. 7. Bake for 20 minutes and cool on a wire rack. 8. Store in an airtight container in the refrigerator for up to 1 week. These also freeze great for up to 1 month. Wow, these look delicious! I don’t know single dog that wouldn’t go nuts over these, I mean real bacon pieces?! Come on! 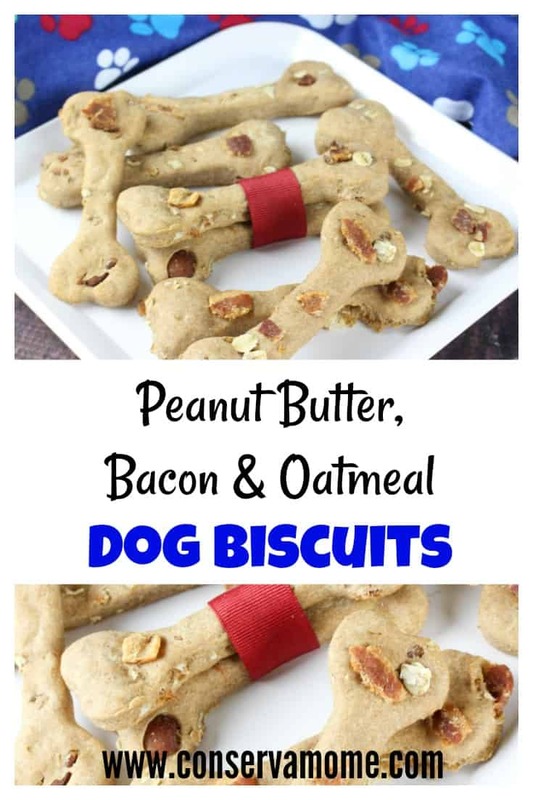 🙂 I will definitely be making some for our pup, thanks for sharing the recipe! I love making my own dog treats. We haven’t tried these yet so I’m saving the recipe. Thanks for the post. My dogs love you. Oooh!! What a fun mix!! And they look adorable! We have a bunch of fluff friends that we would love to gift these too! We don’t have a dog, but I think these would be fun to make! I am definitely trying these for Christmas! My dogs are always spoiled around the holidays but this would be just enough to make this year the best!